multilateral feeds to domestic and international broadcasters parallel” are just a few key words of features that were implemented by LIVE PARK. From current season (2011/12) T-Mobile Ekstraklasa matches are shown internationally. Media rights have been aquired by Eurosport 2, sportdigital.tv, Sport 5 Israel and even Kenyan Zuku Sports. Before that, Ekstraklasa's matches were watched only by Polish audience, generally in pay-tv channel Canal+. Now part of the games is also shown on Polsat's sports channels. This means the need for production of up to 3 versions of parallel transmissions. Additionally, up to four matches of each season are also shown on open television (this year it is TVP - Polish public broadcaster). 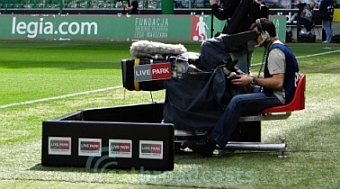 LIVE PARK Broadcasts Services is responsible for live production and broadcasting of each Ekstraklasa's match. LIVE PARK is a Warsaw based media service provider to sports organizations and broadcasters. Company is jointly owned by Ekstraklasa and U.COM Media. LIVE PARK uses big production vans e.g. Legia Warszawa vs Lech Pozna? match was produced on the biggest OB van, called "HD 7". It was because of need of multifeed production including 3 different unifeed video for Canal+, Polsat and TVP along with POL/ENG Graphics. Additionally, matches for the international audience are produced with English on-screen graphics as individual feed. Each match is produced and broadcast in HDTV 1080i/50 with stereo sound or Dolby Sorround (using up to 16 audio channels simultaneously). Full view of all sport situations is available due to 13 video cameras. There are also slow motion (Super Slomo) cameras used in some events. All the replays are done on 6-channel EVS equipment. Video and audio streams (clean and dirty feeds) are stored on XD-CAMs. Furthermore 4 copies of the match are made on DVD. All the signals produced by LIVE PARK are delivered and multiplexed into single stream and sent by fiber link to Canal+ Polska headquarters. Then Polsat's version is remultiplexed at Canal+ and then redistributed directly to Polsat. International SD feeds are sent by the satellite. Sometimes SNG vans are used as a backup. TVP used its own SNG van to feed the match's coverage. last year all Wisla Krakow matches are transmitted by Israeli television Sport5. One game in each round is shown live also in Cyprus, and three meetings of each series in 17 countries in Africa on Zuku Sports.